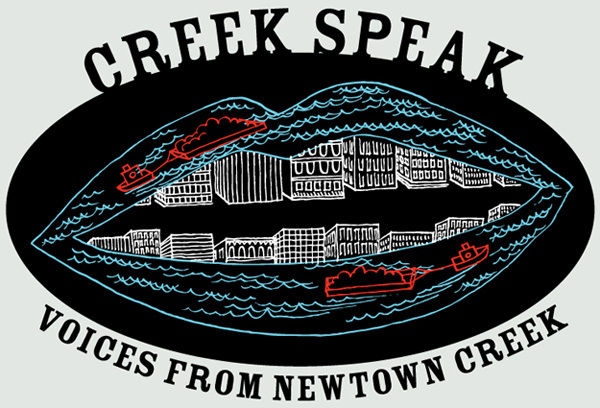 Creek Speak is an oral history project that uses online interactive maps to present the stories of people and places near Newtown Creek. To listen to peoples stories or read about some of the places they mention, simply click on a map marker. After decades of dealing with slow/failed remediation efforts, recalcitrant industrial polluters and frequently unresponsive regulatory authorities, many Creek-side communities have become defeated, resigned to privately worry about their health concerns without hope for significant environmental improvement. The Creek Speak Project has been designed to reverse this equation, inspiring community action by identifying shared health and environmental concerns and demonstrating the possibilities for positive change. The Creek Speak report is not intended to prove causality between the environmental burdens in these neighborhoods and public health concerns. Rather, its purpose is to highlight and document the experiential knowledge of individuals who are inside narrators of day-to-day life in these communities. People who have a first-hand understanding of their neighborhood – who everyday use their eyes, ears, and noses – can provide essential contextual information that would otherwise be ignored or lost. The Creek Speak Project methodology is rooted in oral history, which privileges the anecdotal and subjective information of participants. As with any qualitative study, its reliance on memory provides a rich tapestry of impressions and insights but historical and scientific accuracy is not guaranteed. 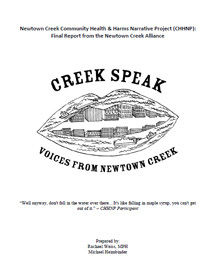 It should also be noted that this project does not claim to represent all of the varied perspectives on Newtown Creek from the hundreds of thousands of people who have lived or now live in communities along Newtown Creek. Want to post the Creek Speak maps to your own website or blog? Simply view the Creek Speak maps on HabitatMap, click “Add to Your Site”, and grab the embed code. You can also embed the individual audio stories by visiting the Newtown Creek Alliance YouTube page. Sharing community knowledge about our neighborhoods can enhance not only the environments in which we live, but also the health and well-being of the people who live in them. When shared widely, your community knowledge has the power to advance not just your own cause, but the cause of like-minded organizations and activists confronted by similar challenges and opportunities around the world. HabitatMap is a place for you to share what you know about a place, discover what other people know about the neighborhood, and organize to achieve just and sustainable urban places. Start a HabitatMap profile to add text, images, and audio to the Creek Speak place markers or create your own map at www.HabitatMap.org. Rachael Weiss received her Masters of Public Health at Hunter College in 2009 and is currently pursuing a Doctor of Public Health in the field of Epidemiology at the Graduate Center/CUNY. She is a research fellow at the Urban GISc. Lab at Lehman College working on environmental justice and geospatial disparities in health. Her research interests include neighborhood determinants of healthy active aging. Michael Heimbinder is Founder and Executive Director of HabitatMap, a Brooklyn based non-profit that builds web tools to support grassroots environmental organizing. He is also a technical advisor to the Organization of Waterfront Neighborhoods where he consults on solid waste management issues in New York City. Yvonne Kodl is a graduate student at The George Washington University School of Public Health and Health Services. Her interests include preventive and maternal and child health. Suzanne Snider’s work has appeared in several magazines and a few artists’ catalogs. She teaches courses on oral history, song hunting, and fieldwork at the New School University and NYU and is currently completing a book about two communes on adjacent land. Andrea Muraskin is an independent journalist who has produced segments for WNYC’s Leonard Lopate Show and WAMC Northeast Public Radio. She is currently studying radio documentary at the Salt Institute for Documentary Studies in Portland, Maine. Some of her radio work can be heard at www.prx.org. Jed Crocker is a budget administrator at The New School for General Studies and Milano The New School for Management and Urban Policy. A graduate with a degree in Creative Writing from Eugene Lang College at The New School, he is also a musician, audio/video editor, and photographer living in Brooklyn. *Creek Speak was made possible by an Environmental Justice Community Impact Grant from the NYS Dept of Environmental Conservation. *The Creek Speak illustration was created by Daniel Heimbinder.